Runton Hill Cottage01263 715779work01603 870304fax Self-cateringRunton Hill Cottage offers spacious accommodation in West Runton on the north Norfolk coast. The village has a beach, golf, cafe, shops and beautiful woodland and is close to the Coastal Path, Felbrigg Hall and Sheringham Park. There is a rail link with access to the seaside towns of Sheringham and Cromer as well as the cathedral city of Norwich, and the Coast Hopper bus enables exploration of other coastal villages and towns. An attractive coastal cottage convenient for exploring the local area. 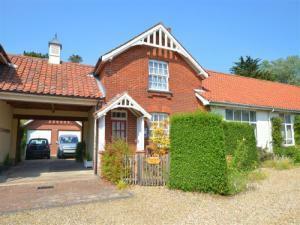 Runton Hill Cottage offers spacious accommodation in West Runton on the north Norfolk coast. The village has a beach, golf, cafe, shops and beautiful woodland and is close to the Coastal Path, Felbrigg Hall and Sheringham Park. There is a rail link with access to the seaside towns of Sheringham and Cromer as well as the cathedral city of Norwich, and the Coast Hopper bus enables exploration of other coastal villages and towns.